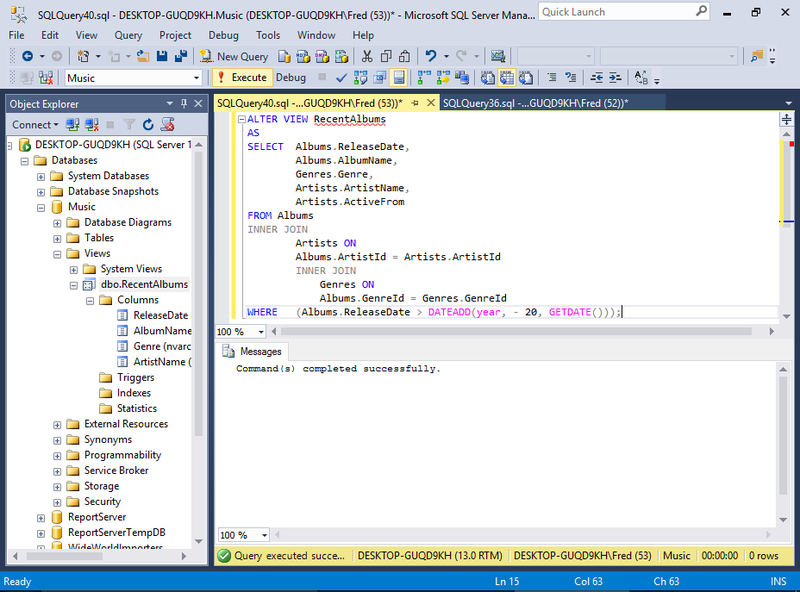 In SQL Server, you can queries as views. Views are beneficial for many reasons, including security, usability, and convenience. 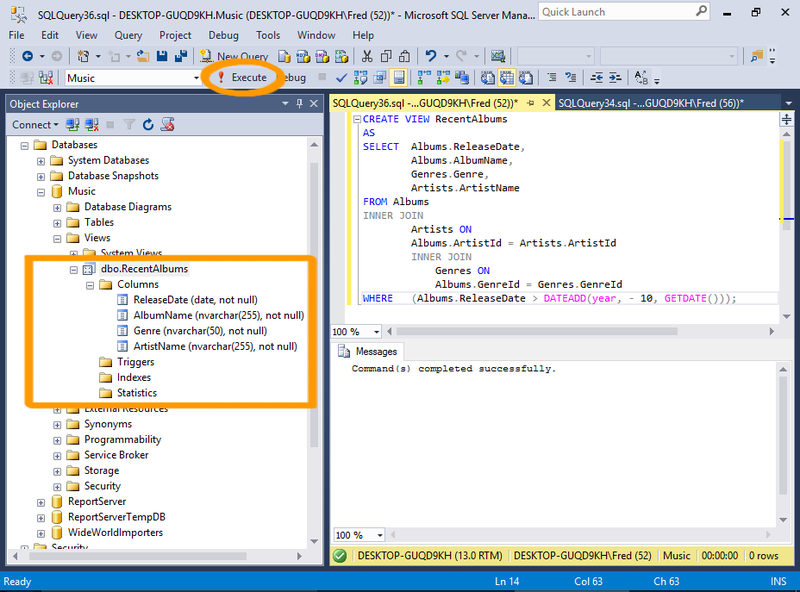 In SQL Server, a view is a virtual table whose contents are defined by a query. It is basically a pre-written query that is stored on the database. 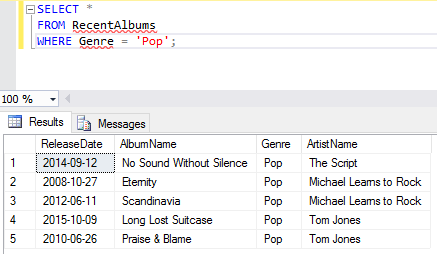 A view consists of a SELECT statement, and when you run a query against the view, you see the results of it like you would when opening a table. Views are referred to as virtual tables because they can pull together data from multiple tables, as well as aggregate data, and present it as though it is a single table. We'll now create a view from our previous query. 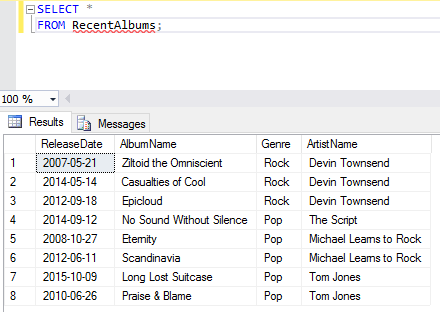 Take the query from our previous example, and prefix it with CREATE VIEW RecentAlbums AS. Also remove the ORDER BY clause, because views don't support this clause (unless TOP, OFFSET or FOR XML is also specified). Also add a semicolon to the end of the statement, as a statement terminator (more on that below). Below is the code from our example, with the ORDER BY clause removed, and a semicolon added as a statement terminator. I've also reformatted it a bit to make it more readable). In this example I added a semicolon to the end of the view. The Query Designer didn't include this, but it's good practice to include it. The semicolon is part of the ANSI SQL-92 standard. It is a statement terminator character. Also, Microsoft has announced that non-semicolon ending Transact-SQL statements are deprecated in SQL Server 2016, and they won't be supported in a future version (SQL Server has historically used the GO keyword as a statement terminator instead of the semicolon). Now execute the view just as you would execute any other query. Click Execute on the toolbar. You can now navigate to the view in the Object Explorer. Expand it and you'll see the columns and their data types and properties — as though it was a table. Now that the view has been created, you can query the view by running a SELECT statement against it. 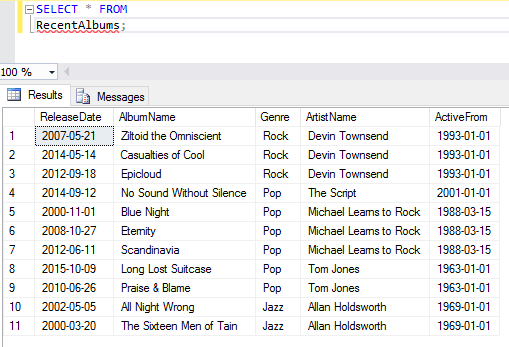 So you can query our newly created view by using SELECT * FROM RecentAlbums;. One of the good things about views is, you can apply your own filtering criteria against them — further filtering the results. For example, you could add WHERE Genre = 'Pop', so that the view only returns pop albums from the last 10 years. 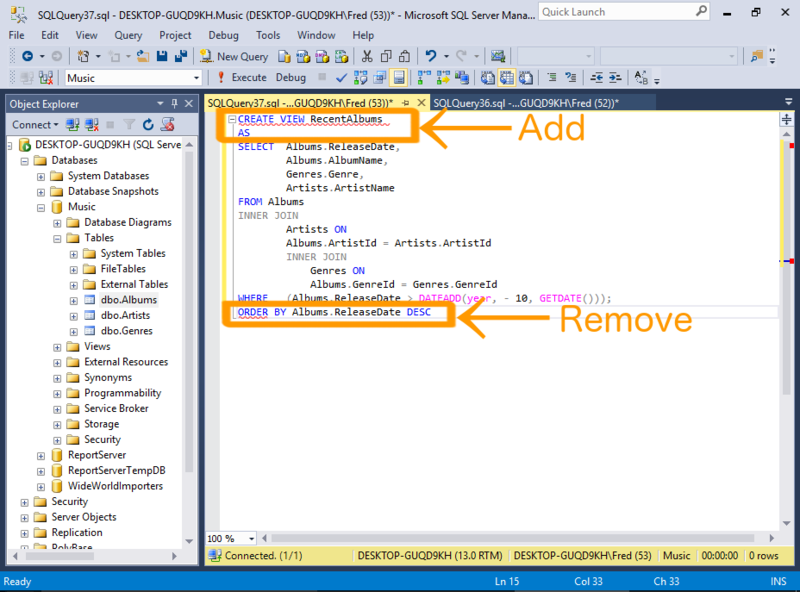 You can modify your view by using the ALTER VIEW statement instead of the CREATE VIEW statement. Here we will modify our view to return albums over the past 20 years instead of just 10. Now, querying the view will return 20 years worth of albums. It will also display the date the artist was active from.